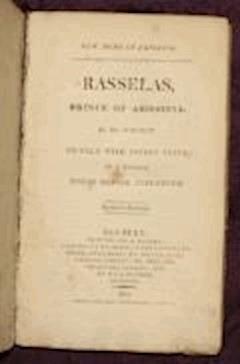 Rasselas, Prince of Abyssinia (or Ethiopia), grows dissatisfied with the unceasing pleasures of his utopian home in the Happy Valley. According to Ethiopian tradition, the children of royalty were confined to an edenic valley, secluded from the harsh realities of the outside world. Rather than being seen as a paradise by Rasselas, Happy Valley is instead considered to be a prison, harboring boredom and tediousness. So, accompanied by his teacher, his sister, and her lady-in-waiting, Rasselas escapes his idyllic homeland to experience the outside world and search out the way of life most likely to lead to lasting happiness.